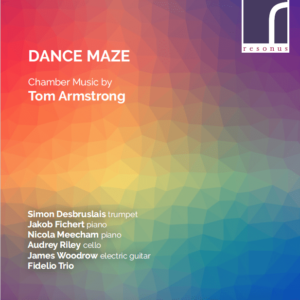 My CD Dance Maze was released on Resonus Classics at the end of November. It contains solo piano and chamber music spanning around a decade of work. The CD has a theme – the revision process in composition; pieces occur in different versions (such as Divertissements/Diversions 3 and Dance Maze: Variations for Piano/Duos for Trumpet and Piano/Solos for Trumpet) or (as in Morning Music) are presented as ‘satellites’ that offer different perspectives on the material of a central work (in this case Aubade). 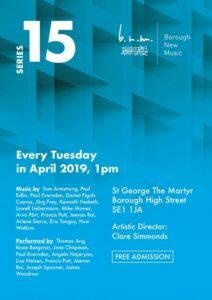 I am a featured composer in the April 2019 series of Borough New Music with a concert of three pieces performed by Jane Chapman, James Woodrow and Jeevan Rai. It features another revision (of the original version of Divertissements for electric guitar and harpsichord) and a performance of Moto (for harpsichord and electronics) composed in collaboration with Jeevan Rai. 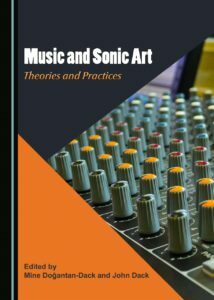 My chapter ‘An Experimental Turn: A Composer’s Perspective on a Changing Practice’ was published December 2018 in Music and Sonic Art: Practices and Theories edited by John Dack and Mine Doğantan-Dack. The chapter is an account of my work from 2009-14, an important period during which I was trying to get to grips with a more more indeterminate approach to notation, form and the way I worked with performers, an approach that I continue to pursue and refine. Capriccio, Morning Music, Albumleaves and Araxne are used as case studies, examining the extent to which I succeeded in enfolding performers’ creativity more fully into the music.